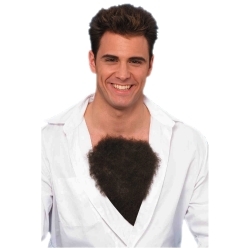 This brown hairy chest is the perfect addition to a macho man, caveman, or werewolf costume. The hairy chest is easily applied using the included theatrical adhesive tape. Additional theatrical adhesive tape is available so the chest hair may be used multiple times. The chest hair is available in brown and measures 9” tall by 8” wide.